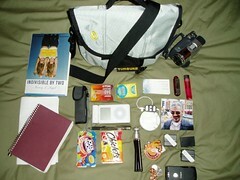 By popular demand here's a picture of my "murse" along with it's contents. Run over to Flickr where I've labeled everything. wish I had thought of this blog post. why are you carrying soap? The soap is actually pretty cool, it's little "sheets" (like dryer sheets) and it works great when there's no soap around. soooo cool! Love all your pics! What is up with the voiceovers? It's weird how things work out?